Riddle, aka Jerry's Joker, is fine looking 2½-year-old male who is white with brindle patches. 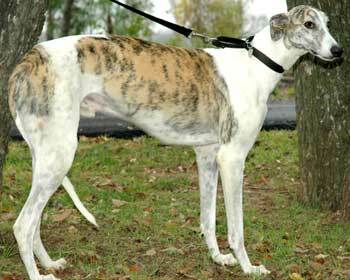 Riddle was born May 22, 2002, and his sire is Gable Dodge, making his grand sire Wigwam Wag. His dam is Kuntas Lil Angel. Gable Dodge has been sire to many GALT greyhounds, Horse, RCA, Walt, Sable, Elmo, Brindy, Janie and Kelly to name just a few. 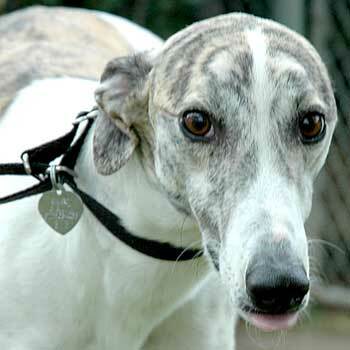 Greyhound-Data.org does not list any races for Riddle, so it is doubtful if he ever made it beyond his schooling days. Riddle is ready to find his forever home and family. It is not known at this time if Riddle is small animal or cat tolerant.